Any paint set should have colors of great crispness and also an assortment of choices. The Daniel Green paint set offers vibrant colors and a quality arrangement of oil paints for the most demanding of artists. The paint will last longer and artists can enjoy creating their artwork. Any oil set of paint purchased should always provide vibrant colors and a quality set of paints. Daniel Greene is a master trainer and artist with a long history of fabulous artwork. His paint set is known as the best for keeping the paint vibrant over time and preserving the quality of the artwork. His work as an artist is important and the choice of his oil paints can make artwork easier to prepare. The set as a palette of colors was developed by Jack Richeson & Co. and was prepared for the great artist Daniel Greene. The Daniel Greene Line of oil paint is a superb selection with some of the finest oil paints produced. The palette of colors will set apart the artwork and prepare the artist for a creation of great work. Oil paint should stand up to tests for both duration and also quality. The Daniel Greene paint set is for the demanding artists that require the finest oil paints. All artwork must have a plan for preparation and the oil paints are part of the most important steps for preparing to paint. The paints developed by Jack Richeson & Co. are prepared with the understanding of the requirements for both quality and color vibrancy. The Daniel Greene pet set brings out the best in the colors with the assortments that are included. The oil paint set includes a quality arrangement with great vibrancy of colors for the best paintings and artwork. 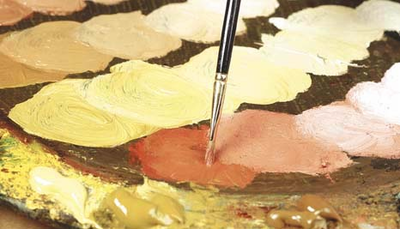 The artwork requires a paint set that brings out a color for each part of a painting and all palettes must blend well. The colors also should bring out the best in a mixing arrangement. The palette is also a blended arrangement if needed by adding additional amounts and all paintings are easily produced.